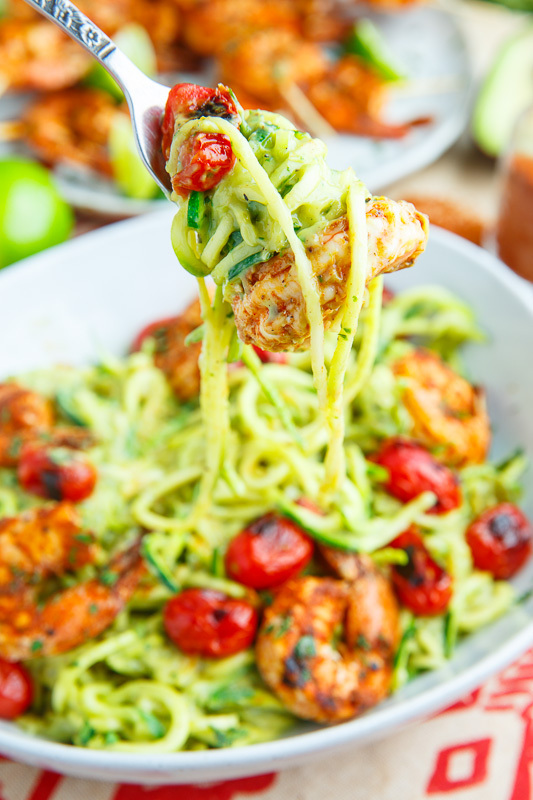 Light zucchini noodles tossed in a creamy avocado and tomatillo sauce with taco lime grilled shrimp and juicy roasted tomatoes! 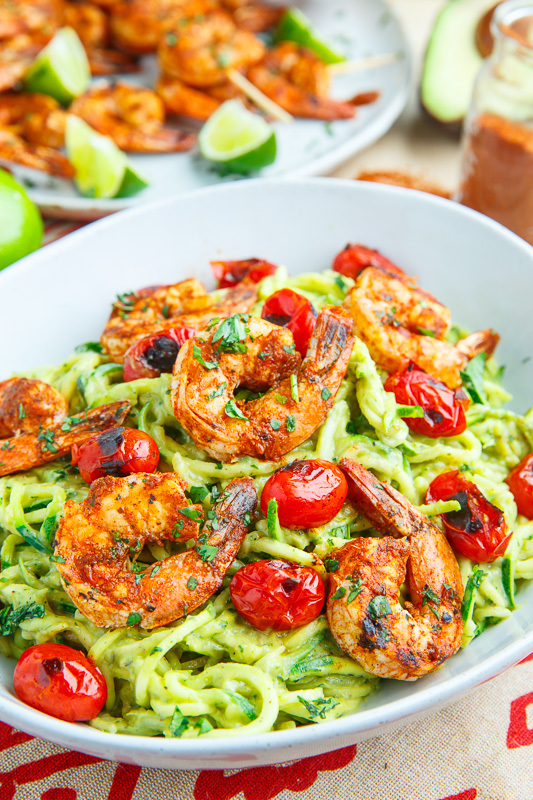 Up first for this years menu of new recipes for Cinco de Mayo is a light, healthy and oh so tasty creamy avocado zucchini noodle pasta with taco lime grilled shrimp. This dish starts with a creamy avocado sauce with roasted tomatillos and a touch of spicy heat from a jalapeno chili pepper. Up next is the star of the show, some simple, finger licking good, taco lime grilled shrimp! The shrimp is marinated in a mixture of lime juice and a home made taco seasoning before being skewered up and grilled to perfection. Up next are some cherry tomatoes that are roasted until they are charred and tender but still burst in your mouth juicy! Everything is tossed with some light and healthy zucchini noodles, though this would also be amazing with regular spaghetti noodles! 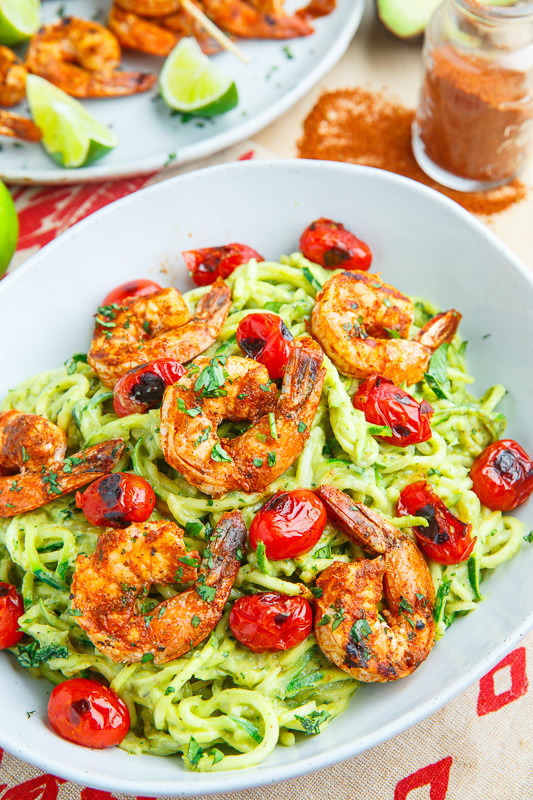 This creamy avocado zucchini noodle pasta with taco lime grilled shrimp is nice and light and healthy in addition to being sensationally good and it’s bound to be the star of your Cinco de Mayo menu, though there’s no reason to wait arourd for Cinco de Mayo to enjoy it! 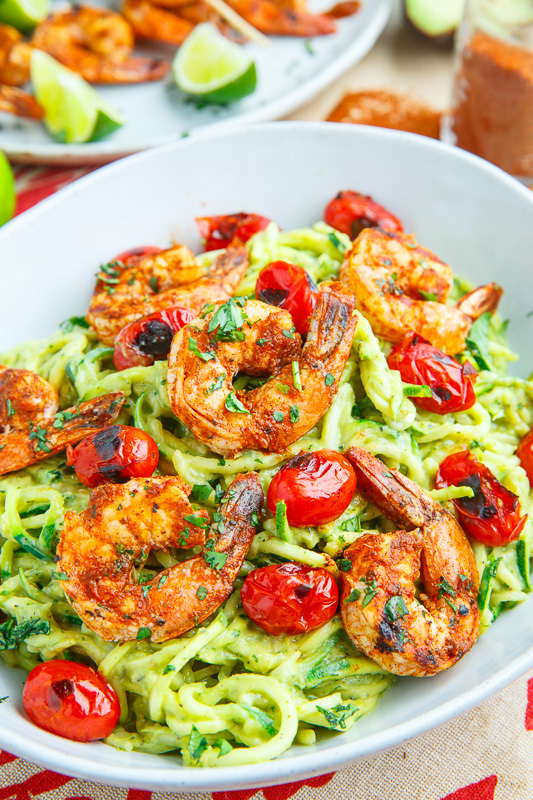 Option: For One-Pan: Make this a one-pan meal by pan searing the shrimp in the pan before the tomatoes and set aside, returning to the pan with the zucchini noodles. Option: Top with crumbled bacon!!! Option: Top with crumbled queso fresco or feta! 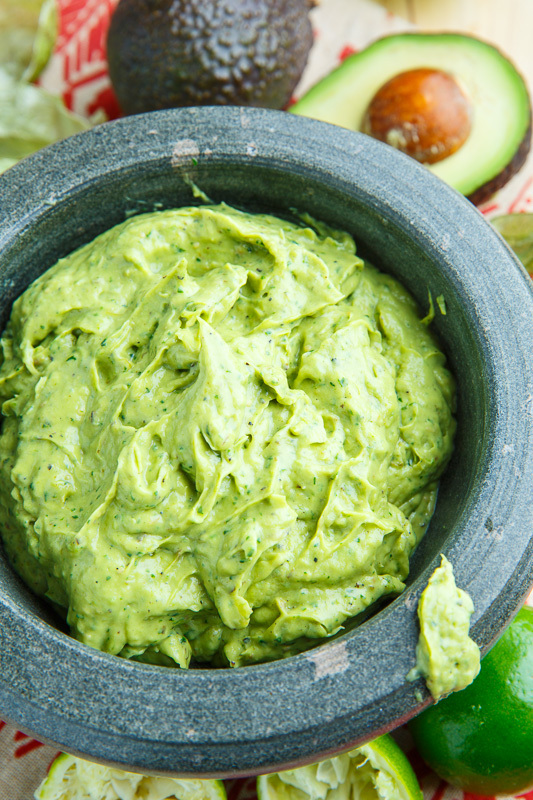 A creamy avocado and roasted tomatillo sauce that is perfect for scooping with tortilla chips, tossed with pasta or used as a condiment! Option: Add 1/4 cup sour cream to make it even creamier! I have three avocados that need to be used up since I'm going out of town this week. Can't wait!! I'm currently going low-carb, so this is perfect. It so bright and yummy looking!! What a gorgeous dish! So bright and perfect for Cinco de Mayo! Absolutely delicious! I love how vibrant the colors are! Half of my family doesn't like avocados, I wonder if I could get away with serving them this avocado sauce? I'd have to do chicken since my son is allergic to shrimp, but this looks so delicious!!! I love using zucchini noodles! Approximately how many cups of zucchini noodles? This recipe looks amazing!! Oh this was so good!! !